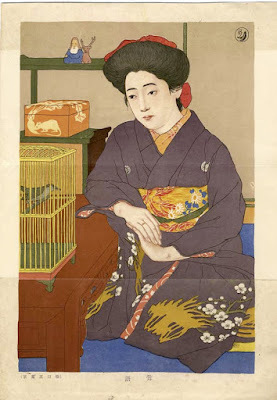 Hashiguchi Goyo (1880-1921)(橋口五葉) - A bijin looking at a bird in a cage. Signed: Sealed, reading "go" in kanji and a sketch of two leaves (yo). Publisher: Juseido. Published in the magazine "Shin Fujin", 2nd year, 1st month. Date: Meiji 45, 1st of January (1912). Printer: Probably Toppan Printing Company. Condition: Good, usual two fold marks, slight discoloration to flaps, as usual, a few minor tears on margins, some slight foxing and discoloration, light creasing. Impression: Fine, a rich and saturated impression. Size: Roughly Oban sized, an over sized kuchi-e. 25.5 x 36.9 cm. Another example is published in Hashiguchi Goyo Ten (Exhibition of Hashiguchi Goyo), Odakyu, Tokyo, 1995, p.214, ill. 327. The technique for this kuchi-e is crayon lithograph. Judging the style and excellent technique of the lithograph work and the printing, the kuchi-e was most probably made by Toppan Printing Company. In 1910 Toppan introduced the best and most modern equipment available in the world. They quickly mastered the full potentials of the equipment. Toppan’s excellent lithographers managed to produce some of the best crayon lithographs ever done. This is seen especially in the works by Kitano Tsunetomi, but also Hashiguchi Goyo and many of the most famous artists of the period. Goyo made a poster for Mitsukoshi Department Store (at this time known as Mitsui Gofuku-ten). This poster became the most well-known poster in Japan. The Goyo poster was a "Style" definer and widely collected. Today it is very scarce, even in very bad condition. Goyo was together with the more well-known (in Japan) Sugiura Hisui the main designers for Gofukuten (Mitsukoshi). Most works done by them for Gofuku-ten are unsigned, sometimes one encounters Hisui’s signature mark on various works but it is very rare to find Goyo’s mark. Most often one has to relay on stylistic sensibility to separate their works. This piece is with our paper conserver for slight conservation treatment. Delivery 14 days. Hashiguchi Goyo, Japnese print for NYK brochure.